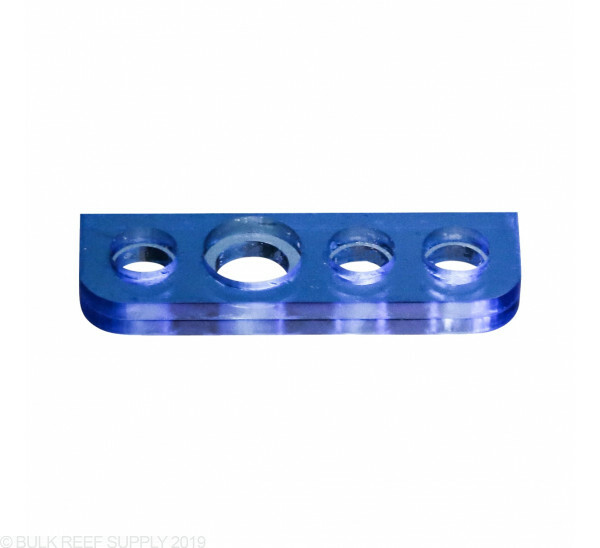 The perfect sump design for reef tanks that use the Triton Method! 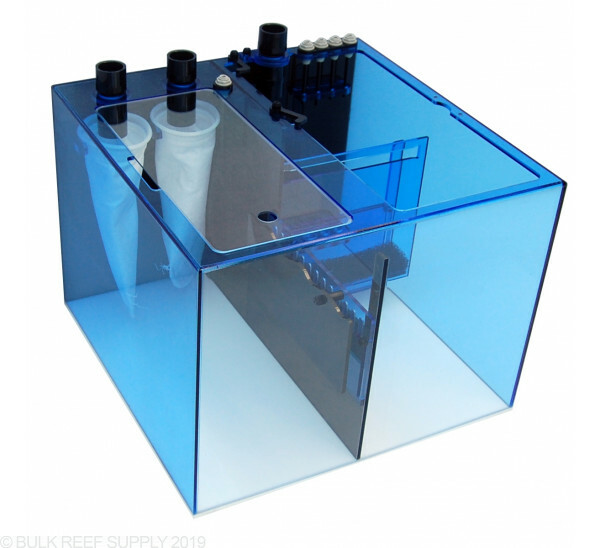 The Triton20 V2 Sump is great for aquariums up to 90 gallons and specially made to have a large refugium that meets the 10% volume recommendation for the Triton Method of reefing. Now with optional filter sock holders, configurable drain adapters, and other additional features the new generation of Triton sumps from Trigger are definitely the way to go if you are planning on using the Triton Method. 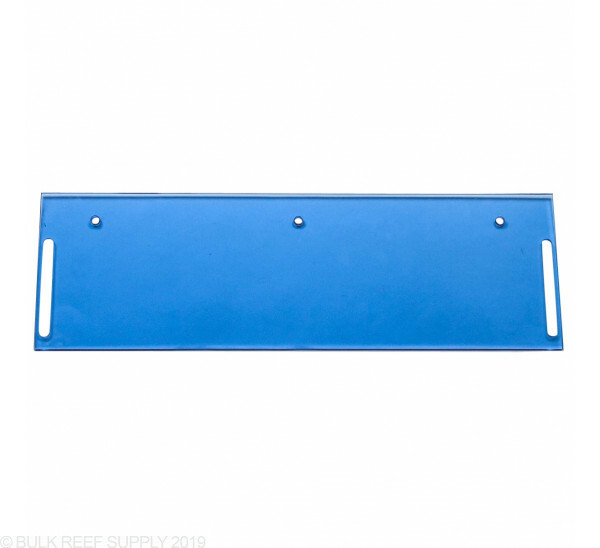 Refugium Section - 19.5" x 9.25"
Skimmer Section - 10" x 11"
Return Section - 6" x 10"
Designed for the Triton Method of Reefing! Protein skimmers can work at various water levels but may lack in efficiency. 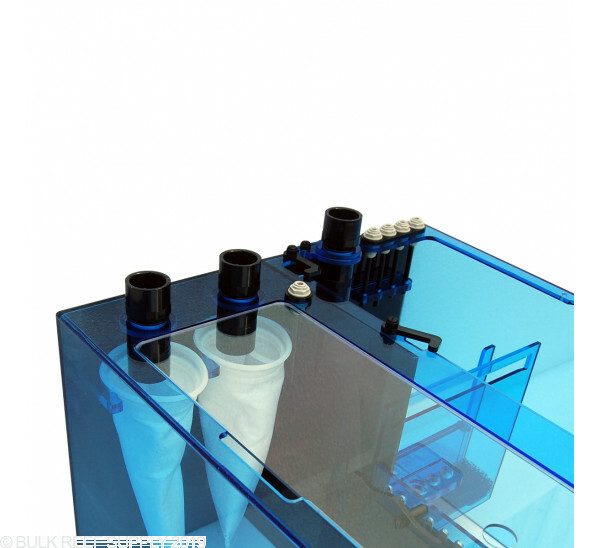 Tuning your sumps water level to the skimmers needs can dramatically increase the amount of skimmate produced. In most cases, reefers will put a stand under their skimmer to elevate it, but Trigger's Triton20 sump lets you adjust the water level inside of the protein skimmer section from 7" up to 9.5" with laser etched markings. 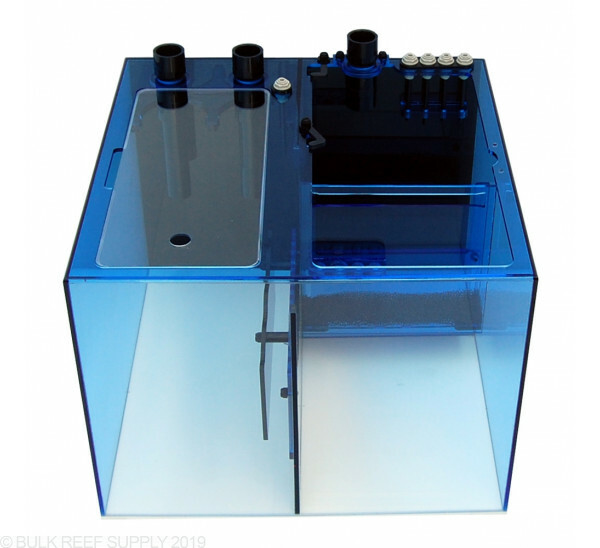 Triggers Triton20 V2 sump features an adjustable refugium water level that lets you maximize the size of the refugium section while keeping things quiet. 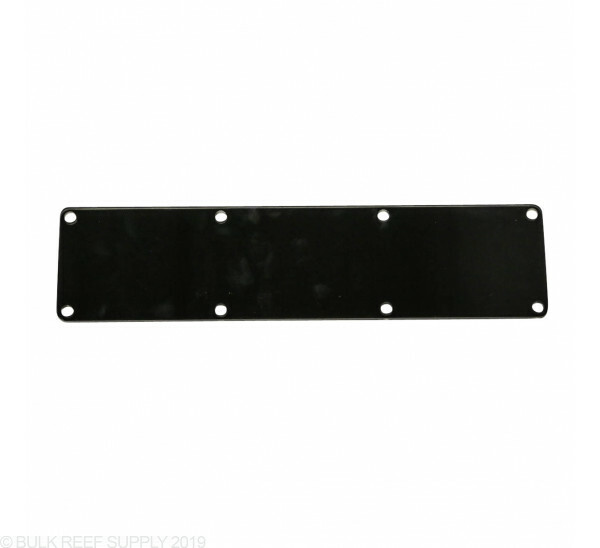 Depending on your flow settings through the refugium, and your protein skimmers section water level, water noise may be created and by adjusting the refugium water level the noise and splashing through the baffle can be eliminated. With the Triton method, they suggest using multiple types of algae and some of them may float. The Triton20 V2 includes an algae block that keeps floating strings of algae from clogging and blocking the teeth of the next baffle. The blocker also helps prevent excess light from spilling into the skimmer section. 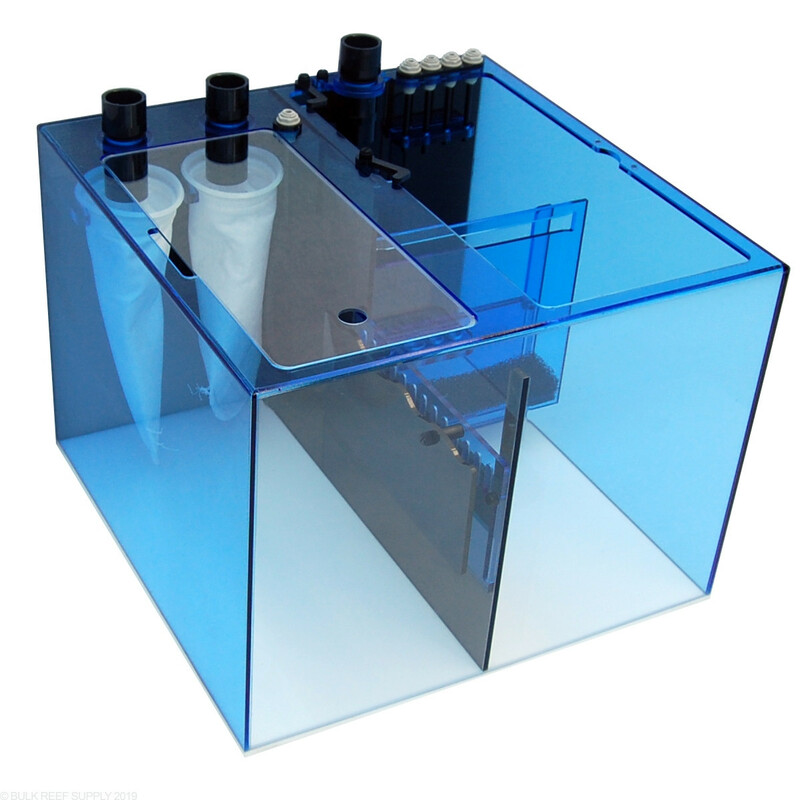 Each sump comes with a perfectly cut clear polycarbonate lid that helps keep excess evaporation from occurring. The lid will sit on a flange, allowing it to sit flush with the top of the sump. 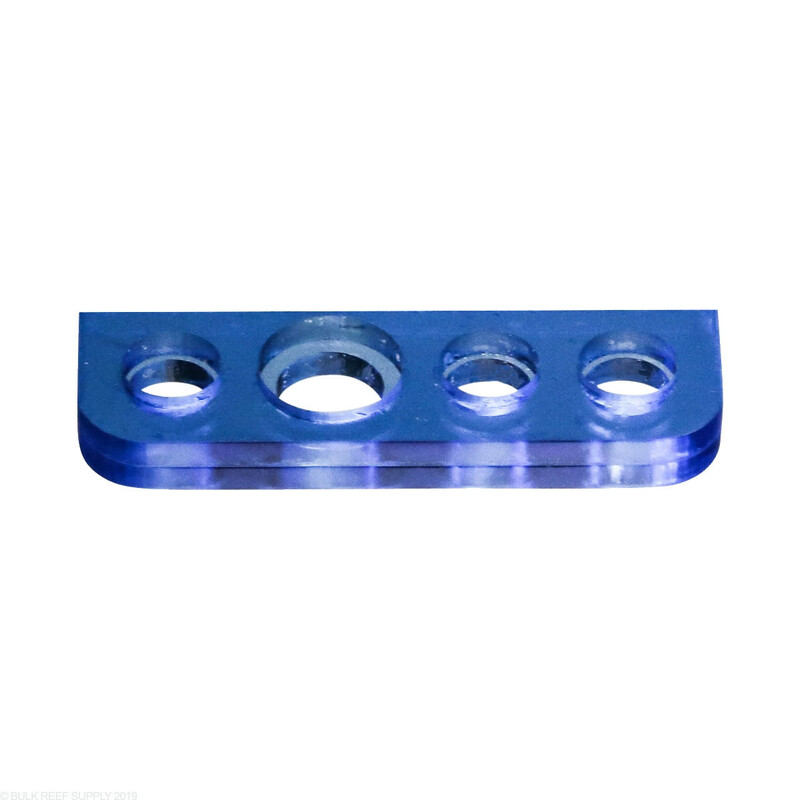 The sumps bracing even has a notch cut that allowing most light mounts to attach without interfering with the lid. Each Triton20 V2 includes a configurable drain adapter, that lets you place an additional drain pipe anywhere you want. If you have a bean animal drain system, place it in the skimmer chamber, want to use it for your return plumbing, place it over the return chamber. 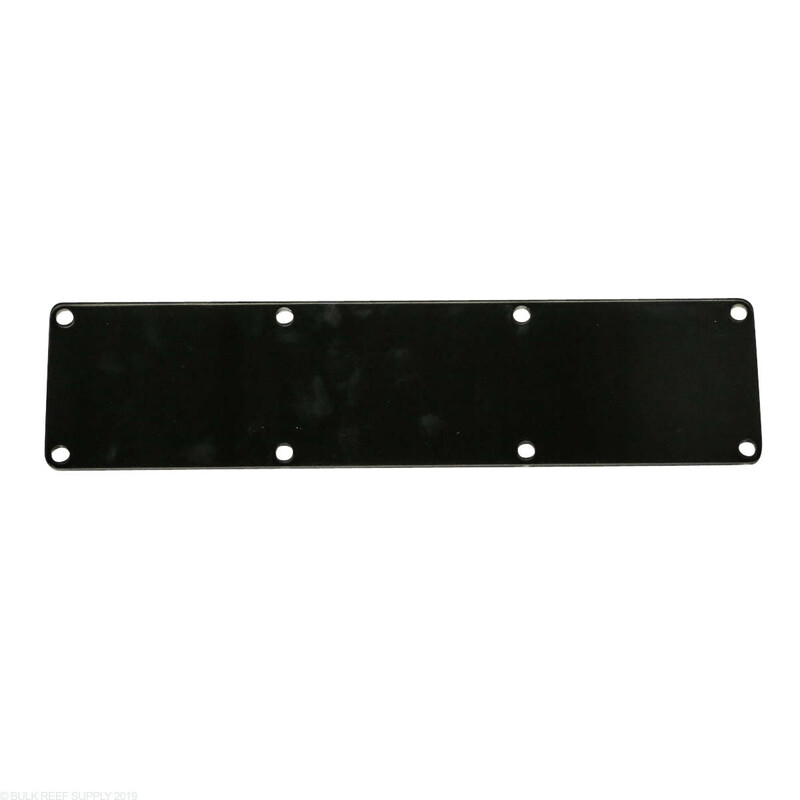 With simple thumb screws, the adapter plate can be moved or removed in just seconds. 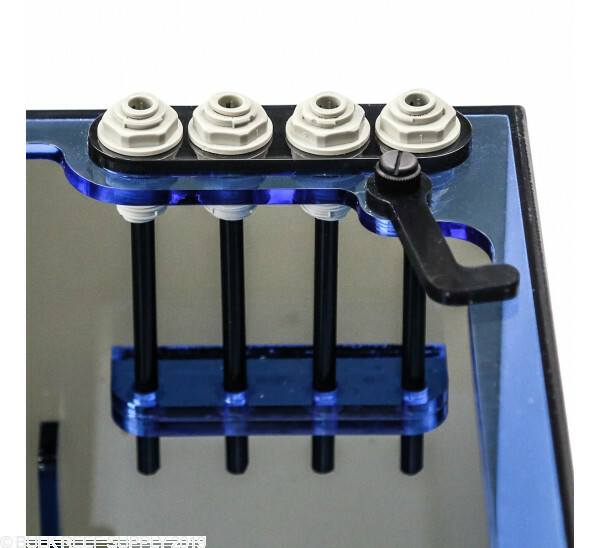 Keep your probes and dosing tubings secure. Hold up to 4 probes in the skimmer section of the sump in the preinstalled probe holder. Each hole is countersunk to keep probes from falling through and one is enlarged to fit a Neptune temperature probe. 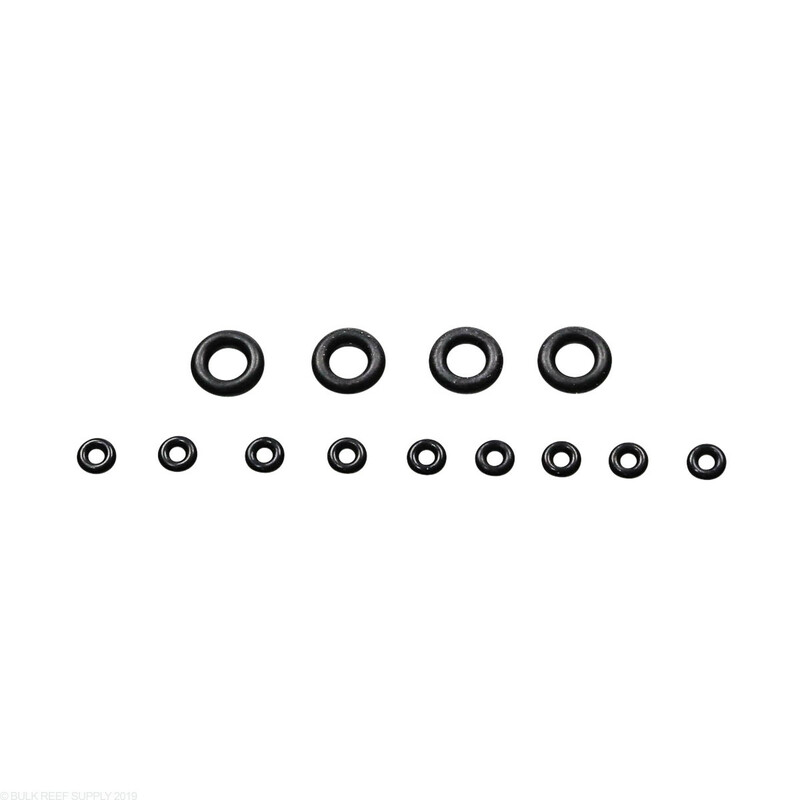 Installing an included o-ring on each probe, you can ensure they will not fall further down into the hole. 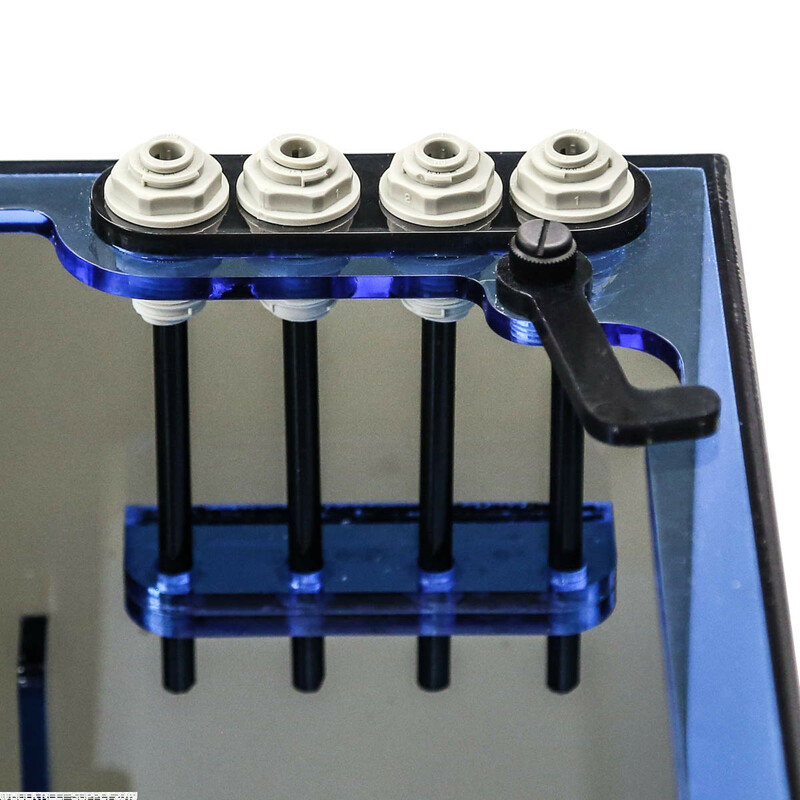 Dosing tubes can be secured into the included push-connect fittings that will dose into the return chamber of the sump. 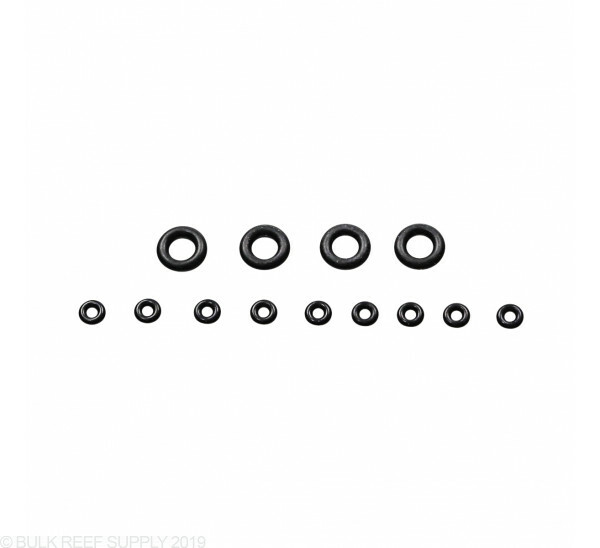 Each push-connect fitting will accept standard 1/4" tubing that is used with most dosing pump systems. As water flows up through the final baffle, there is a tray that can hold media blocks, bags or any other form of media that you choose. Since the flow direction through the baffle will be pushing the media up, Trigger includes hold downs and a second platform that can secure your media right where you want it. 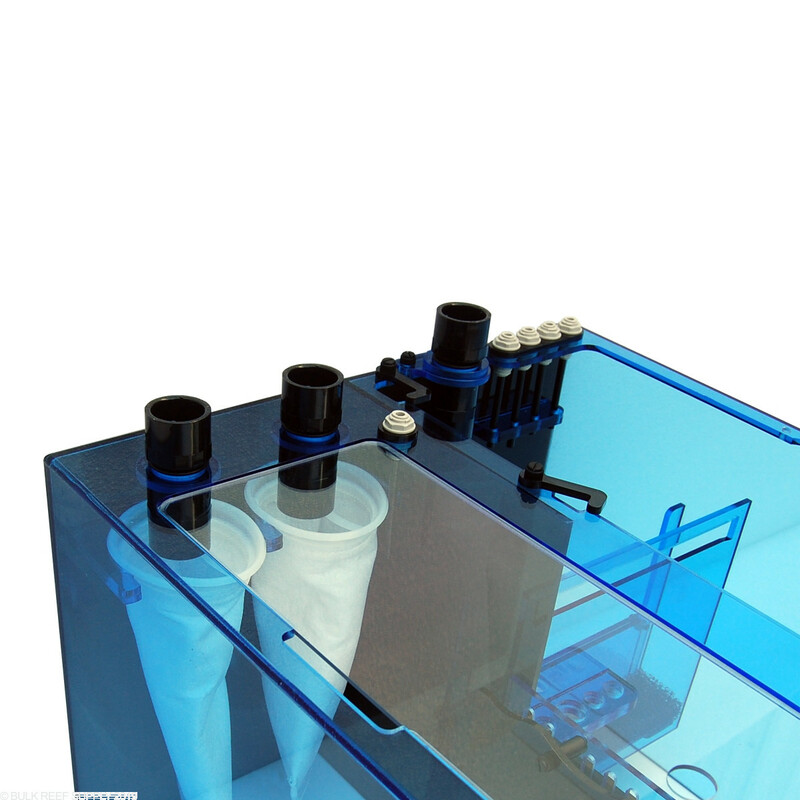 The color choice of the Triton line of sumps was not by accident. 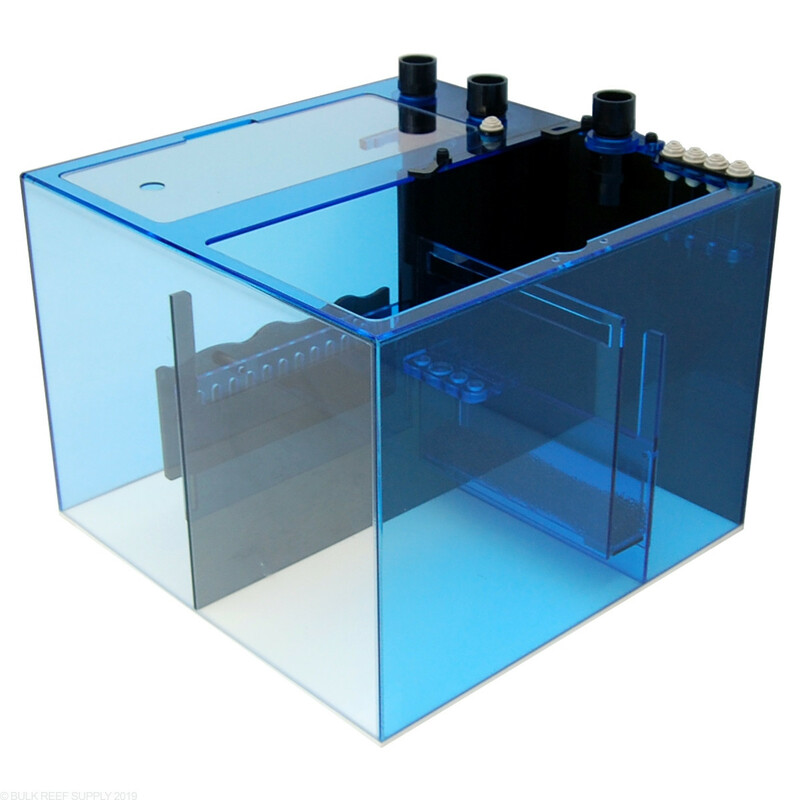 The front of the sump is made of crystal clear acrylic and the back is all black allowing you to hide excess cords behind your sump. 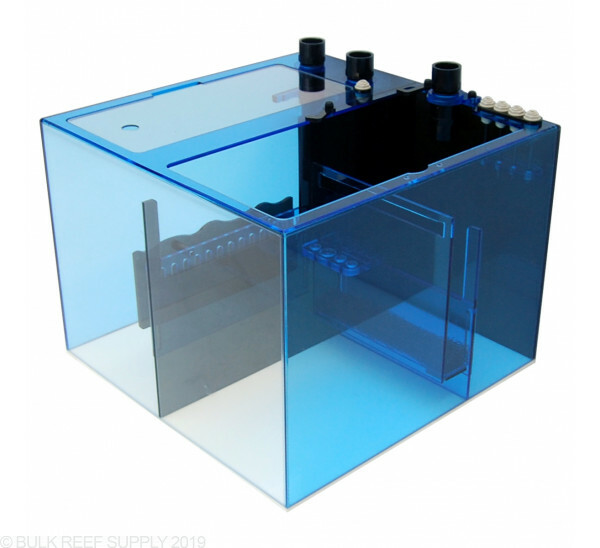 Many of the accents and the side walls are a translucent blue that adds a little bit of character to your sump without being too overpowering. The refugium section has black baffles keeping your refugium light from spilling out into other chambers of the sump and the pure white bottom of the sump helps reflect light back up into the refugium and lets you see when detritus is building up. 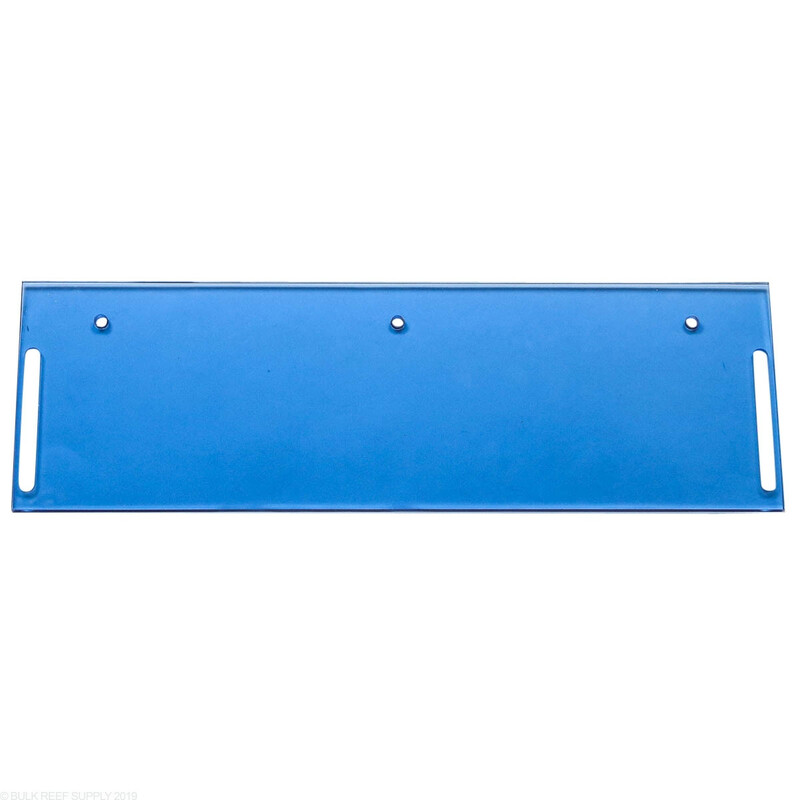 Refugium Section Water Level - 8" - 11.5"
Skimmer Section Water Level - 7" - 9.5"